The rain has let up and cool, fresh evening air is here. Trying to avoid puddles, I walk down Spring Street and hang a right on Lafayette. 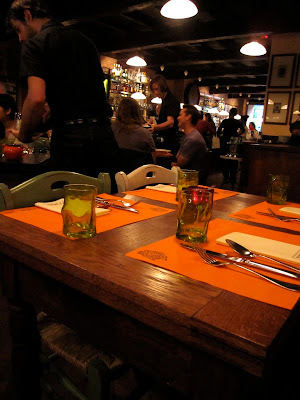 M arrives in a cab to find me seated near the host stand at Osteria Morini. The host won’t seat me until my party is complete, so I’m flipping through my new book. After a false start (the hostess tries to pawn a lousy table off on us; we ask to be moved), we're seated. M is drawn to the fried zucchini blossoms; I order two antipasti. 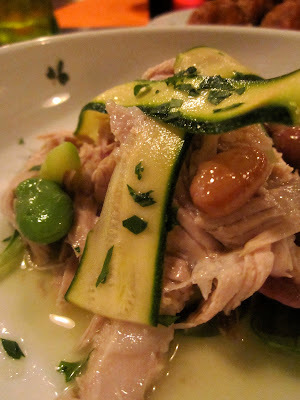 The first is the Ventresca, tuna belly poached in olive oil and layered with pickled onions, barely cooked asparagus, zucchini, fava beans, and borlotti beans. It’s light and summery and my first thought is – Can I recreate this at home? Because I want to. And then – the Polpettine. They’re gorgeous, if you can call meatballs gorgeous. The septuagenarian sitting next to me on the banquette leans over and, eyes wide, asks, “What are those?" 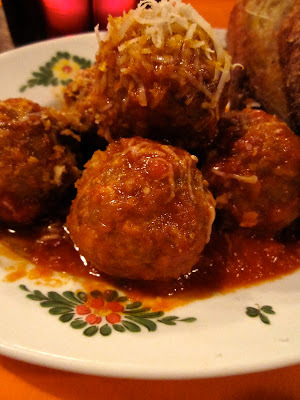 The meatballs are luscious – prosciutto, mortadella, and egg – and served in a tomato sauce. Our waiter tells me that the buttery bread on the side is brioche. Nope. Sorry. There’s nothing remotely brioche-like on my plate. But I mop up the tomato sauce with the bread and I don’t mind too much. Am I involved with food? Yes. It’s a passionate love affair. I eat, I read about food, I write about food, I cook, I plan shopping lists and absolutely epic menus for meals that might never happen. But, to make it easy, I smile and say yes. I say, “I like to write about food.” My new friend is delighted – one of her dinner companions is a writer as well – and she asks for my business card. I hand over two. M’s Brodetto (seafood soup) and my Stracci – pasta rags with braised mushrooms and rosemary oil – arrive. The kitchen has also included chopped tomatoes and a little Parmesan. I don’t taste rosemary. And are the mushrooms braised? Or just sautéed? Don't get me wrong, it’s good. But I think I’ve had this dish before, though I can’t remember where. That’s the concept here: familiar tastes. It’s Italian. It’s not re-interpreted. It’s hearty, tasty, and best accompanied by red wine (the cocktails are a little off and M’s second drink smells like cough syrup). The ceilings are low and the walls are hung with copper pans. It could be clichéd, but we’re in SoHo, so it has to be cool. The soundtrack is U2, the Police, and Florence and the Machine and our scruffy waiter tells us a story about going to the Strand with his dad when he was little. And the restaurant is really, really popular. The next available seating for two is at 10pm. It's a little noisy and everyone's enjoying themselves. After all, it's New York, it's SoHo, and it's time to dig into a platter of meatballs. We’re not so tempted by dessert, so we skip it. Cocktails at Salon de Ning are next.